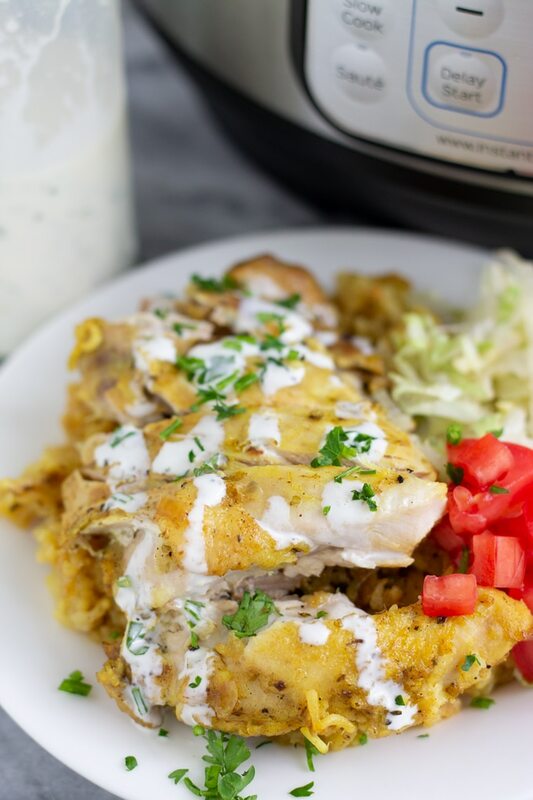 Enjoy the flavors of the popular New York street cart chicken (Halal Guys Copycat) right in your pressure cooker with this Instant Pot Chicken and Rice Dish. This quick and easy delicious dinner can be ready in less than 30 minutes. This post may contain affiliate links. My full disclosure is available here. I love New York City, especially the food. In law school, I took a trip to New York for a conference. Ask me if I remember what the actual conference was about…I don’t. What I do remember is traveling with some wonderful law school colleagues, seeing Swizz Beatz on the street and asking for a pic (he was so cool about it too), partying at the 40/40 club, and standing in a long line at 3am waiting for some chicken that was sold in a cart. Yes, you read that right, I like to eat chicken at 3am. That literally was the best street food I had in my life and I knew for sure it was something that I had to recreate in my own kitchen. I found that my Instant Pot Pressure Cooker was the perfect vessel to recreate this dish. I’m always making one-pot meals in my Instant Pot, like my ever so popular Pressure Cooker Shrimp Paella. In fact, I use my pressure cooker so often I’ve made a whole recipe category just for you all in the recipe section of the site. 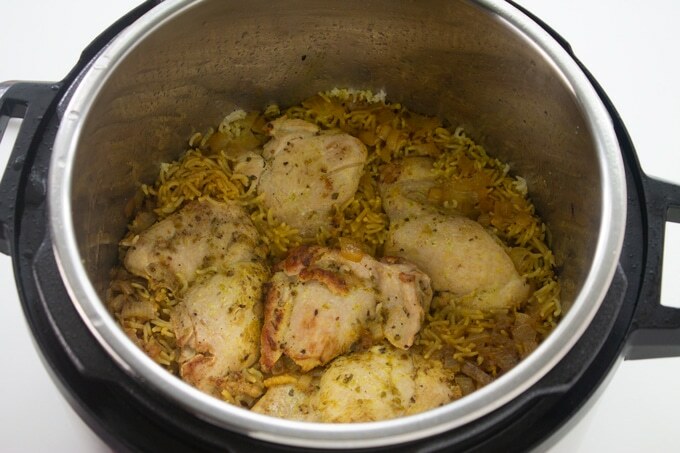 I adapted this street chicken and rice recipe from the Serious Eats website and perfected it for my Instant Pot. The recipe as written on their site is pretty delicious but I truly didn’t feel like marinating the meat when it came to this dish. Making this dish in the pressure cooker is perfect for a weeknight meal. 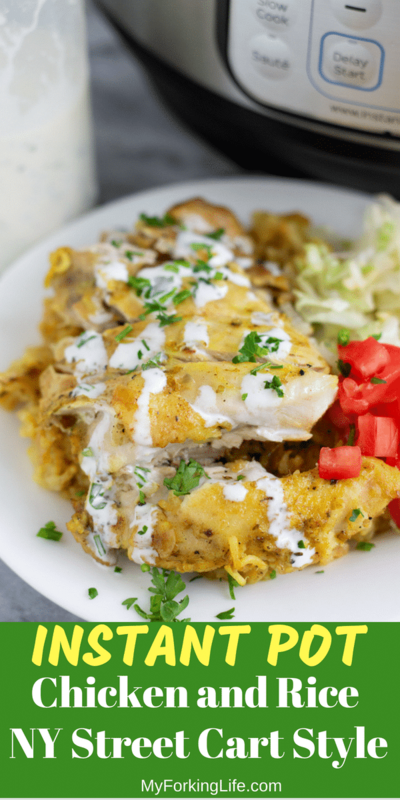 First, you’ll want to make the famous white sauce for this chicken and rice dish. 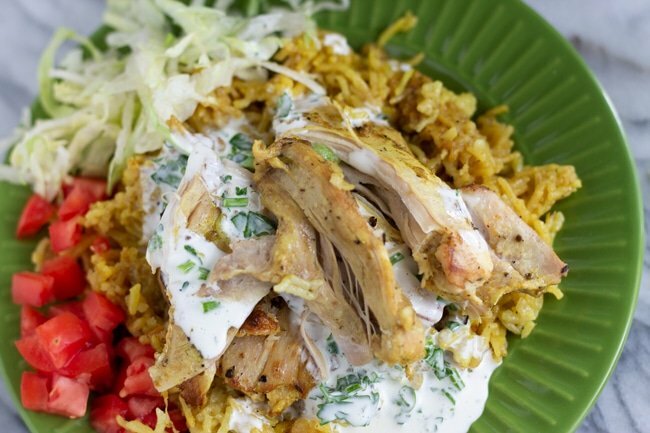 This sauce has a tangy yet slightly sweet taste that pairs well with the rice and chicken. Prepare this first and set it aside. Then it’s time for the pot. You’ll want to brown your chicken in the pot to build flavor, especially since we are skipping the traditional step of marinating the chicken. I like to set my sautè function on high to get a good caramelization. Just make sure you don’t overcrowd the pot when browning as you won’t get a nice sear. Cook your chicken thighs in batches for the best results. Next, you will have nice brown bits (they may even look a little burnt). This is fine, don’t freak out, it’s flavor! 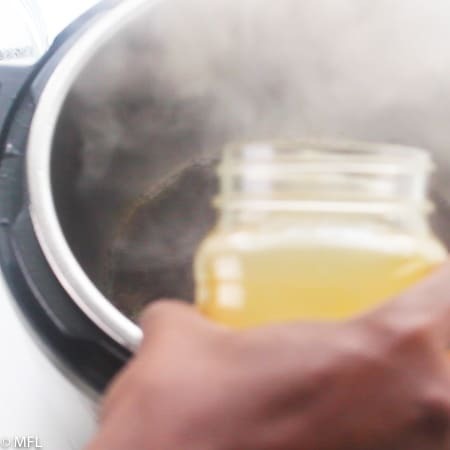 Take a bit of chicken broth and deglaze the bottom by pouring the broth into the bottom of the pot. Take a wooden spoon and scrape the bottom bits up. Make sure it’s a wooden spoon as you don’t want to scrape the bottom of your pot with metal utensils. Next, add your onions and garlic and sauté them until the onions have softened. Make sure onions are softened a bit before adding the garlic. You don’t want the garlic to burn or it will give your dish a horrid taste. Then add your rinsed rice. Rinsing your rice will allow the rice to remain fluffy and not stick to the bottom. 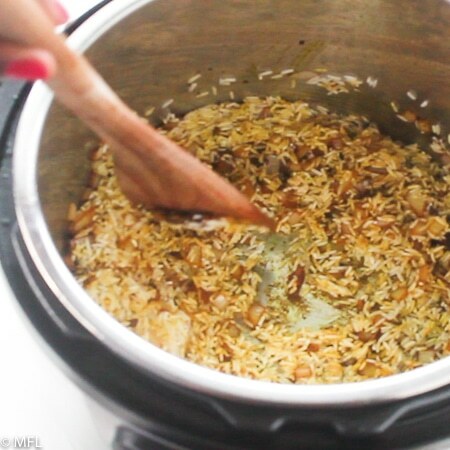 Rinsing your rice is key for any rice dish in the Instant Pot Pressure Cooker. Add your remaining seasonings, broth, and your chicken back to the pot. Push chicken into the broth to ensure it gets fully cooked. Set the pressure cooker for 10 minutes. Once time is up, allow it to naturally release for 10 minutes, dinner is served. 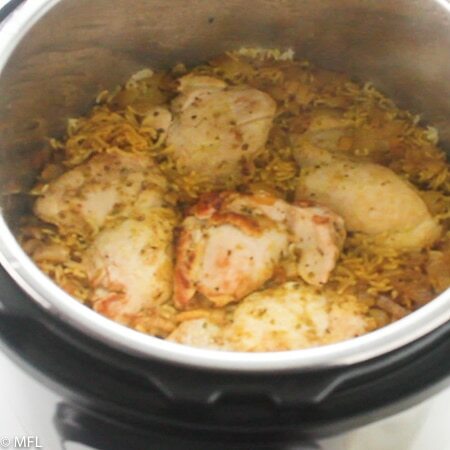 Do you really have to brown the chicken in the Instant Pot first…that is the question? Yes, yes, and yes. I get it, you may not want to but the purpose is to build flavor since you aren’t marinating the meat. I hope you enjoy this recipe as much as we do…and don’t forget the sauce. For more photos of the operation of the Instant Pot, check out my Pressure Cooker Shrimp Paella recipe. 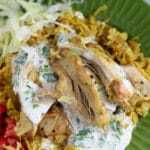 Make the white sauce by whisking all white sauce ingredients in a medium-sized bowl. Set aside. 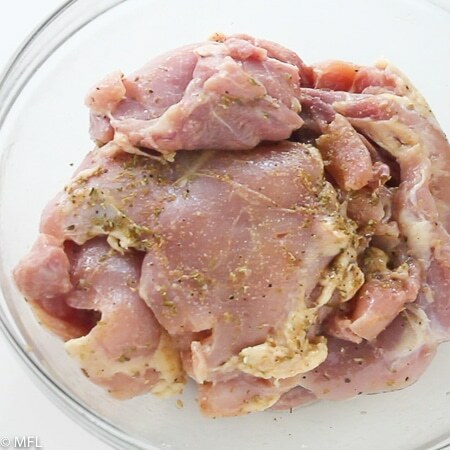 Combine chicken, lemon juice, 2 Tbsp olive oil, oregano, garlic powder, and ground coriander. Set the Instant Pot to saute function. Once Instant Pot says “Hot,” add 2 Tbsp olive oil to the pot. 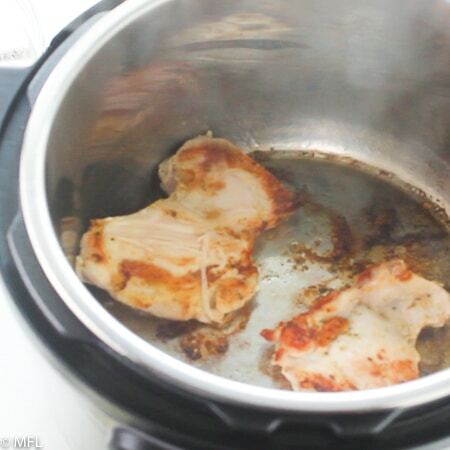 Add 2 or 3 chicken pieces to the pot and allow to cook until browned on each side, about 3-4 minutes each side. Remove and set aside. 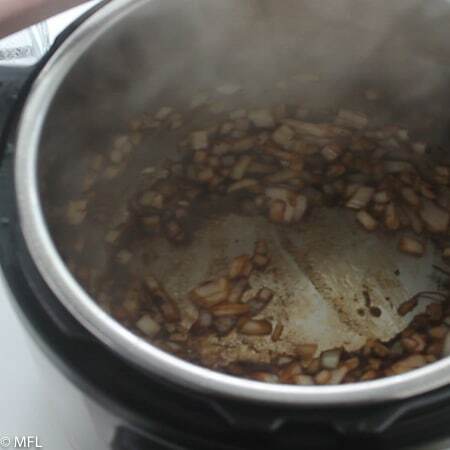 Add about ¼ cup chicken broth to the pot and use a wooden spoon to deglaze pot by stirring up brown bits. Then add onions and garlic and cook until onions have softened. Next, add turmeric powder, cumin, and rice and stir to coat rice. 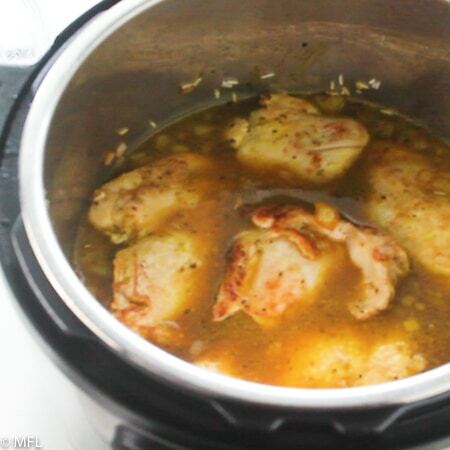 Add remaining chicken broth and place chicken thighs on top of rice, ensuring they are covered by the broth. Turn the Instant Pot off by pressing “Cancel.” Press “Pressure cook (make sure it’s set to high pressure), set timer to 10 minutes. Place cover on Instant Pot and make sure valve is set to sealing. Once the timer is up, allow Instant Pot to natural release for 10 minutes, then quick release. Open the cover and add the desired amount of salt and pepper. Combine the white sauce ingredients in a bowl. Stir to combine. Brown the chicken on the sauté mode. Do it in batches. Then add about 4 Tbsp of chicken broth to pot to deglaze. Stir up brown bits. next, add onion and garlic and stir until softened, ensuring all brown bits have been stirred up. then your rinsed rice, tumeric and seasonings. Turn off sauté function. Add chicken broth and chicken thighs to pot. Turn off sauté function. Pressure cook on high pressure for 10 minutes. Allow to natural release for 10 minutes, then quick release. I’ve made this for my family twice and we’ve loved it both times. Thanks for such a delicious recipe — this is going in our regular rotation. Also grateful for the other recipes you’re publishing — not the same as everyone else, and really helpful! thank you so much Brent 🙂 So glad you all enjoyed this one. 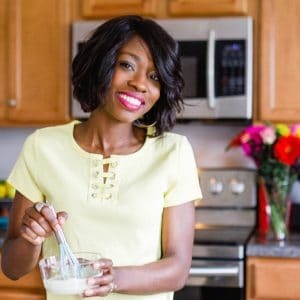 I truly appreciate your feedback on my other recipes as well, it truly keeps me motivated to keep on developing recipes for my IP. Fundamentally flawed approach. Chicken must be marinated for 4-12 hours to infuse flavor. The problem with instant pots and pressure cookers, in general, is that they will tend to be under seasoned. Missing the marination step is not good. White sauce is under-flavored as well, missing things like garlic and sumac. I appreciate the detailed description on how to get the rice correct, which the author must be given kudos for. Finally, the recipe misses how it is to be served, with lettuce, tomatoes, and toppings like peppers, olives and more hot sauce. Hi Chris, the chicken can me marinated if needed (I linked to the original recipe in the post where it is marinated) but I didn’t find much difference in flavors. I’ve made this recipe both ways many times. The purpose of the skipping of the marinade is for a quicker option. 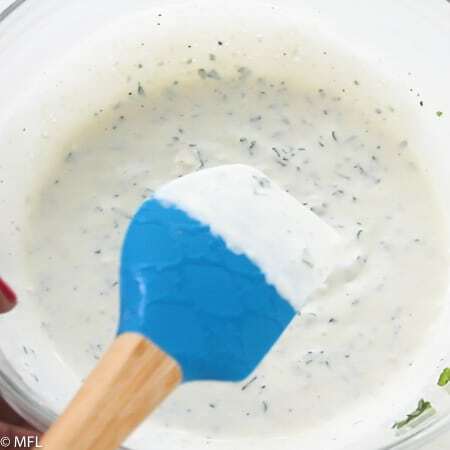 As far as the white sauce, my recipe is a base, garlic and sumac could be added to the white sauce, although most home cooks don’t have sumac in their pantry. Ironically, I do, but don’t think this white sauce needs it. Finally, in the recipe card, I do list that I suggest it be served with shredded lettuce and tomatoes. The majority of my readers have made it this way and served with lettuce and tomatoes and we all like it just as is. Either way, my recipe is just a guideline for other cooks who want good food in half the time. Please let me know if/when you make this recipe. Thanks. This was an easy twist on the usual chicken and rice in the IP. I let the meat marinate for about 20 minutes in the spices, fresh garlic, and a little olive oil before cooking. I’ve never had street cart chicken from an actual street cart, but the stuff from my instant pot was 5-star delicious! Thanks for this great recipe.